For a totaly stylish ensemble without the need to sacrifice on practicality, we turn to this combination of a Marc Jacobs Animal Sequin Striped Sweater Navyoff White from Neiman Marcus and white jeans. As for footwear, complete your look with black elastic wedge sandals. This seriously stylish outfit is so simple: a Marc Jacobs Animal Sequin Striped Sweater Navyoff White and blue skinny jeans. Rock a Marc Jacobs Animal Sequin Striped Sweater Navyoff White with blue ripped skinny jeans to create an interesting and current casual ensemble. For a more elegant aesthetic, add black leather loafers to your outfit. A Marc Jacobs Animal Sequin Striped Sweater Navyoff White from Neiman Marcus and grey plaid dress pants are amazing must-haves that will integrate really well within your day-to-day casual wardrobe. 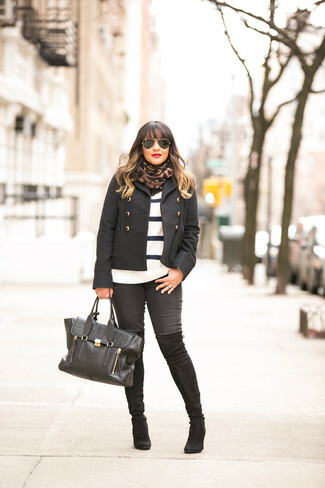 This pairing of a white and black horizontal striped crew-neck sweater and black skinny jeans resonates comfort without compromising style. Parade your elegant side by rounding off with black suede over the knee boots. 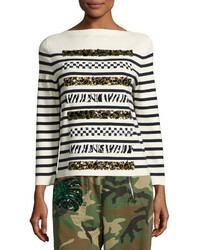 Pair a Marc Jacobs Animal Sequin Striped Sweater Navyoff White from Neiman Marcus with black skinny jeans if you seek to look cool and relaxed without much work. The whole look comes together really well if you add a pair of tan suede chelsea boots to the mix. 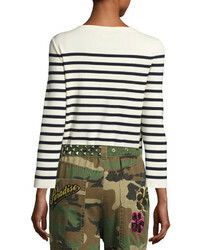 This combo of a Marc Jacobs Animal Sequin Striped Sweater Navyoff White and a multi colored horizontal striped pencil skirt is an obvious choice for off duty. For something more on the classier end to round off your outfit, complete your look with black suede pumps. 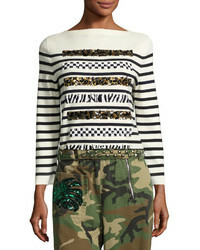 Dress in a Marc Jacobs Animal Sequin Striped Sweater Navyoff White and blue denim shorts for a relaxed and stylish getup. For something more on the dressier end to complement your look, complement this look with brown leather loafers. This combination of a Marc Jacobs Animal Sequin Striped Sweater Navyoff White and black leather skinny jeans is the perfect balance between relaxed and chic.